Introduction: Primary aldosteronism affects 5-13% of patients with hypertension. Idiopathic bilateral hyperplasia (IHA) and unilateral aldosterone-producing adenoma (APA) are the most common types of primary aldosteronism. Bilateral APA is a rare entity with only few reports in the literature. We describe the case of a patient with metachronous bilateral APA treated with metachronous bilateral total and subtotal adrenalectomy. 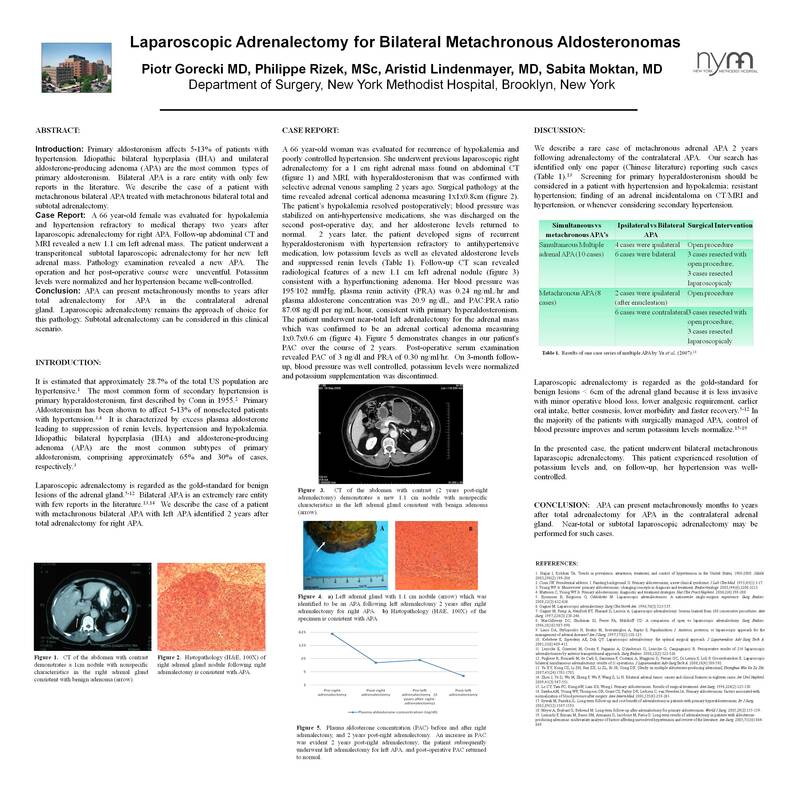 Case Report: A 66 year-old female was evaluated for hypokalemia and hypertension refractory to medical therapy two years after laparoscopic adrenalectomy for right APA. Follow-up abdominal CT and MRI revealed a new 1.1 cm left adrenal mass. The patient underwent a transperitoneal subtotal laparoscopic adrenalectomy for her new left adrenal mass. Pathology examination revealed a new APA. The operation and her post-operative course were uneventful. Potassium levels were normalized and her hypertension became well-controlled. Conclusion: APA can present metachronously months to years after total adrenalectomy for APA in the contralateral adrenal gland. Laparoscopic adrenalectomy remains the approach of choice for this pathology. Subtotal adrenalectomy can be considered in this clinical scenario. CT radiograms and pathology slides will be presented.